Genna (元和) was a Japanese era name (年号,, nengō,, lit. "year" name") coming after Keichō and before Kan'ei. This period started in July 1615 and ended in February 1624. During this time, the emperor was Go-Mizunoo-tennō (後水尾天皇). The nengō Genna means "Commencement of Concord". 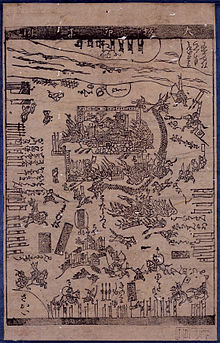 1615 (Genna 1): Tokugawa forces burned Osaka Castle. 1 September 1615 (Genna 1, 9th day of the 7th month): Tokugawa Ieyasu pulled down Hōkoku-jinja. 1616 (Genna 2): Kida Kōan publishes Genna kokaisho, which is a book on ocean navigation. 1 June 1616 (Genna 2, 17th day of the 4th month): Ieyasu died at Suruga Castle. 26 September 1617 (Genna 3, 26th day of the 8th month): Former-Emperor Go-Yōzei died. He was buried at Nikkō. 1618 (Genna 4, 8th month): A comet appeared in the sky. 5 July 1620 (Genna 6, 6th day of the 6th month): The emperor married Tokugawa Kazuko who was the daughter of the shogun. 1620 (Genna 6): There were destructive fires in Kyoto in the 2nd and 3rd month. ↑ Nussbaum, Louis-Frédéric. (2005). "Genna" in Japan encyclopedia, p. 239. ↑ Nussbaum, "Go-Mizunoo Tennō," pp. 256-257; Titsingh, Isaac. (1834). Annales des empereurs du japon, pp. 410-411. ↑ Munro, Neil Gordon. (1904). Coins of Japan, p. ix. ↑ Ponsonby-Fane, Richard. (1956). Kyoto: the Old Capital of Japan, 794-1869, p. 317. ↑ Nussbaum, "Genna kokaisho" at p. 239. ↑ Ponsonby-Fane, p. 317; Titsingh, p. 410. This page was last changed on 10 December 2018, at 16:31.